The plot: Boy rescues Girl from a shipwreck and they begin to fall in love. A few complications – the boy, Idamante, is the son of the King of Crete and the girl, Ilia, is the Princess of Troy. The Trojan War has just ended, so this boy and girl are supposed enemies. King Idomeneo has sworn to kill the one who rescued the princess, not knowing the person is his own son. Add in the jealous Elettra who is in love with Idamante and we have one big mess. Pittsburgh Opera  continues its 2018-2019 season with afterWARds—Mozart’s Idomeneo Reimagined. Mozart’s full-length opera, which includes other characters and a chorus, has been reorganized and distilled by David Paul to focus on just four characters for a “lean and mean” version. What remains with this distilled opera is Mozart’s wonderful music. Many critics describe the opera as one of his most ambitious scores, full of fast passages for the singers and colorful orchestral writing. This opera led to Mozart’s future triumphs, including The Marriage of Figaro and Don Giovanni. Explore more about afterWARds—Mozart’s Idomeneo Reimagined through the CD, DVD and book recommendations on this list. I am quite curious to see how this different version works. Maybe I will see you at the opera! Cairns’ unique biography traces Mozart’s life and creative output through his operas. Cairns discusses how Mozart matured as an artist with each opera and writes about how his strength as a composer of great theater influences his instrumental works as well, particularly his piano concertos and string quartets. The chapter that highlights Idomeneo describes this opera as a point of maturity in Mozart’s operatic output. Mozart turns opera seria, an opera based on classical or mythological themes, on its head and creates his own unique voice for 18th century opera, one full of orchestral color and impassioned vocal writing. 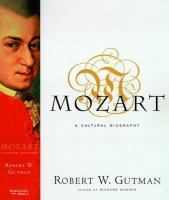 Gutman’s biography, as the title suggests, discusses Mozart’s life in relation to eighteenth-century Europe — the politics, the social scene and the artistic trends. The chapter, “The Second Bavarian Miracle,” details the tempestuous creation of Idomeneo. The emotional turmoil suffered by Mozart during this time led to severing himself from his family, especially his father, and going to Vienna, a city that inspired his greatest opera triumphs, including The Marriage of Figaro and Don Giovanni. Written during the 250th anniversary year of Mozart’s death, Melograni’s biography is a wonderful addition to the many volumes written about the composer. Avoiding in-depth musical analyses, Melograni instead weaves the texts of Mozart’s letters throughout his narrative to create a thoroughly enjoyable account of the artist’s life. A great read for the music lover or novice. Part of the Cambridge Opera Handbooks series, this volume contains several essays that discuss the creation of this opera, its mythological background, and the musical language employed by Mozart in Idomeneo. Ian Bostridge (Idomeneo), Lorraine Hunt Lieberson (Idamante), Lisa Milne (Ilia) and Barbara Frittoli (Elettra) sing the four leads in this strong recording of the full opera. Anthony Rolfe Johnson sings the title role in this recording with John Gardiner and The English Baroque Soloists (performed on authentic instruments). John Mark Ainsley portrays Idomeneo in a modernist production from The Bavarian State Opera. Richard Lewis sings one of his signature roles as Idomeneo in this classic Glyndebourne Festival Opera production.